Today we embark on our fifth weekly #ClickZChat, where the good people of SEW and ClickZ take to Twitter to discuss with our expert friends and followers a particularly burning digital marketing related issue. For this week’s chat, we’ll be talking about location marketing, NFC, beacons, and their usefulness for marketers, so please join us at 12pm EST (5pm UK) on Wednesday 27 April. As preparation for the discussion, I’ve pulled together as many stats relating to beacons as I could possibly find, many of which should provide fuel for the conversation and maybe aid your own location marketing strategy. 1) The value of in-store retail sales influenced by beacon-triggered messages in the United States in 2015 and 2016 was $4.1 billion. 2) In 2016, an extraordinary $40 billion increase is estimated. Statista suggests that beacon messages will trigger retail sales worth $44.4 billion in the US. 3) Men are more likely than women to make a purchase based on personalized advertising they saw on an in-store beacon or display. 4) Among responding male internet users aged between 18 and 34 years, 91% said they were influenced by personalized in-store advertising. Female internet users influenced by in-store beacon tech amounted to 76%. 5) More than 42% of companies already have proximity marketing (such as beacons and geolocation) in place. 39% say they will implement it in the next three years. 18.6% say they have no plans for beacons. 6) The future plans for beacon technology integration is trailing in popularity behind online basket comparison (42%), in-store Wi-Fi (54.3%), scan-and-go (59.3%) in-store bookmarking (62.8%). 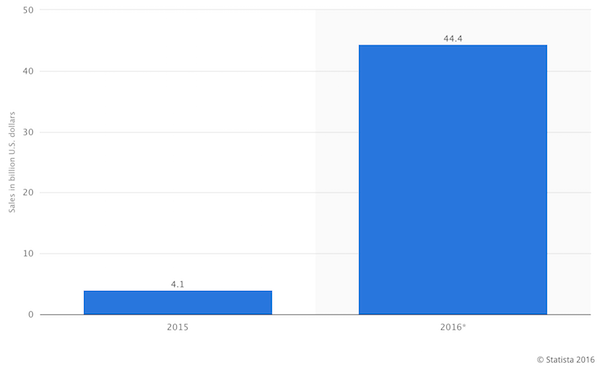 7) 46% of retailers have launched beacon programs in 2015, up from 15% in 2014. 8) 71% retailers are able to track and understand customers’ buying patterns using beacons. 9) 65% feel they are able to target customers down to the aisle level. 10) 59% feel customers are more engaged in the store. 11) 53% retailers feel they are able to create more relevant and compelling offers in the store. 12) 24% retailers saw an increase in sales. 15) By 2018, the beacon installed base will consist of 4.5 million active beacons overall, with 3.5 million of these in use by retailers. 16) Half of the top 100 retailers in the US tested beacons in 2014, this was expected to increase to one-third of their store locations by the end of 2015. 17) Globally, it’s estimated that 570 million Android and Apple smartphones are compatible with Bluetooth low energy (BLE), the signal used by beacons to trigger smartphone apps. This is one-third of the smartphone installed base.